Logistics is a key component in the biopharmaceutical supply chain. In recent times, a dynamic business environment and a supply chain, which is outlined with greater complexity, have fueled the demand for a more precise and targeted approach to temperature control. Nations around the world are tightening their regulations to ensure secure and reliable transportation of pharmaceutical shipments. This has compelled key players to explore novel technologies to pace up with international standards. For instance, the European Union (EU) is concentrating on strengthening good distribution practices (GDP) guidelines. Given the scenario, companies in the region revamping their technological and regulatory expertise. In line with these developments, investments in biopharmaceutical logistics have considerably increased, thus giving the market significant impetus. Spurred by the aforementioned factors, the global biopharmaceutical logistics market is forecast to exhibit a CAGR of 6.2% between 2016 and 2024. At this pace, the market will reach to US$120.7 bn by 2024 from US$70.9 bn in 2015. In terms of mode of transportation, the market has been segmented into air shipping, sea shipping, road shipping, and rail shipping. Air shipping is set to dominate the biopharmaceutical logistics market, in terms of revenue share, however, sea shipping and road shipping are anticipated to garner maximum volume share of the market during the forecast period. The expansion of the air shipping segment is attributed to air freight being the fastest way of transporting pharmaceutical products with negligible damage or product deterioration, which is especially highly desired for transporting temperature-sensitive vaccines and critical biologic drugs. However, air shipping has a limitation of volume which can be transferred, and hence sea shipping and road shipping will outpace air shipping in volume growth during the forecast period. Based on type, the global biopharmaceutical logistics market can be bifurcated into cold chain logistics and non-cold chain logistics. With an estimated share of nearly 80%, the non-cold chain logistics segment emerged dominant in the market in 2015. On account of the increasing use of biologics, the demand for cold chain logistics is expected to increase in the coming years. However, the consistent demand for sophisticated delivery and tracking system is expected to seal non-cold chain logistics segment’s dominance through the forecast period. Regionally, the market is dominated by North America and Europe. These nations have a high number of exports and imports for biopharmaceuticals, and also are the first ones to introduce advanced technologies for the betterment of transportation and warehousing in the supply chain. In terms of challenges, as the global market for clinical trials expands, there are a few obstacles that manufacturers need to be aware of and clear in order to make shipment arrive in an intact state, at the right temperature, and at the right time. Manufacturers and logistics partners need to be dynamic in responding to changes and navigate through geopolitical hurdles to maintain a superior clinical and commercial supply chain. Moreover, in developing nations, costly biopharmaceuticals going waste due to lack of emphasis on cold chain supply is a challenge which can be overcome to further propel market growth. For instance, in India, it is reported that close to 25% of vaccines are wasted due to lack of quality supply chain and logistics management system. Improvements planned by the Government in introducing more cold storage facilities in India, is likely to boost market growth in this region. Logistics is an essential segment of supply chain management. Logistics allows the pharmaceutical companies to establish consistency as well as efficiency through the international supply chain market. The pharmaceutical sector opts logistics for a complete management of acquiring, storing and moving the resources to the end users as per their needs. Logistics provides a continuous supply of bio pharmaceutical products like vaccines, anti-bodies, somatic cells and other biomolecules from sellers and traders in different places. It also allows the transport of pharmaceutical drugs which do not require cold chain control. Nowadays, the pharmaceutical companies have even started to outsource the logistics domain of the company to the third parties. Logistics market is gaining popularity due to fast track execution and better communication, even this market is in constant process to reduce packaging costs. The market has also witnessed rapid growth due to mergers and acquisitions by the existing players. 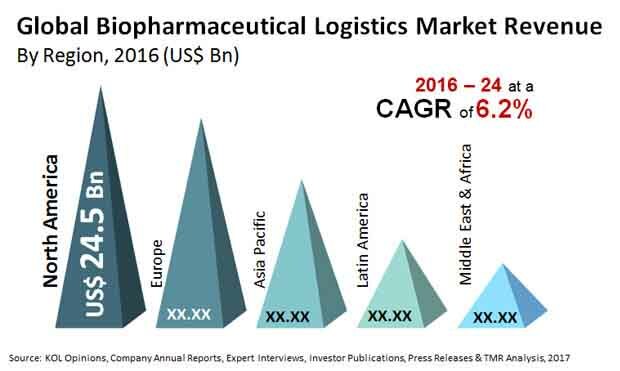 The market for biopharmaceutical logistics shall be driven by factors such as logistics providers having local contacts and know-how, innovation in packaging and increased manufacture and use of biologic drugs.